As early as 1879, public dissatisfaction with the Seated Liberty design was heard in Washington and Philadelphia. It was felt by many that the nation’s coin designs were second-rate, but few could have predicted how mundane a change could really be. New designs were submitted by Mint engravers throughout the early 1880s, but the only outcome was the production of a new nickel in 1883 designed by Chief Engraver Charles Barber. In 1891, when there was much discussion of a public competition for new designs for the dime, quarter dollar and half dollar, Barber reported to Mint Director James Kimball that there was no one in the country who was capable of assisting him in preparing original designs. The Mint Director rejected the panel’s suggestions and threw the competition open to the public. The results of a public competition were equally discouraging. Of the more than 300 drawings submitted, only two were accorded an honorable mention by a four-member panel appointed by Kimball (it should be noted that one of the panel members was Charles Barber). Kimball’s successor to the mint directorship was Edward O. Leech. The latter was well aware of the problems Director Kimball had encountered trying to get new coin designs. Leech avoided what he termed the “wretched failure” of committees and public discussion altogether by simply directing the chief engraver to draw new designs which, of course, is what Barber wanted all along. What Barber did was to modify the large head used on the Morgan dollar by adding a Liberty cap and cropping Liberty’s hair shorter in back. He then placed his initial B on the truncation of the neck. The reverse uses almost exactly the same wreath used on the Seated Liberty dime of 1860-91. What Barber did accomplish with his new dime, though, was to design and place into production a coin that would meet the striking requirements of modern, high-speed coin presses. As a Mint employee he was acutely aware of the need for coins to be designed so they would strike up with one blow from the coin press. His objection to outsiders was, no doubt, due in part to jealousy, but in all fairness he did understand the exacting specifications required to strike millions of coins for commercial purposes. 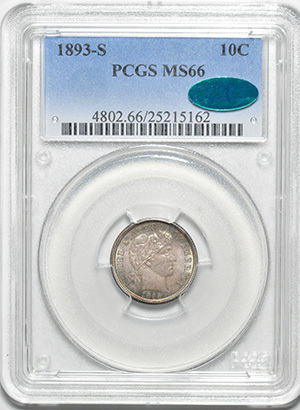 The first Barber dimes were struck on January 2, 1892. Over half a billion pieces were struck during the next twenty-five years. Some issues have mintages as small as 500,000 (such as 1895-O, 1901-S and 1913-S), while others were struck in quantities as large as 22 million (1907-P). At one time or another four mints struck these coins, and the mintmark of Denver (D), San Francisco (S) and New Orleans (O) can be found on the lower reverse below the knot in the bow (there being no mintmark for coins struck in Philadelphia). A Barber dime set, for the most part, can be completed, except for the legendary 1894-S. The low relief design assured that most coins would be sharply struck, except for a few issues from New Orleans (known for weak strikes over the decades). 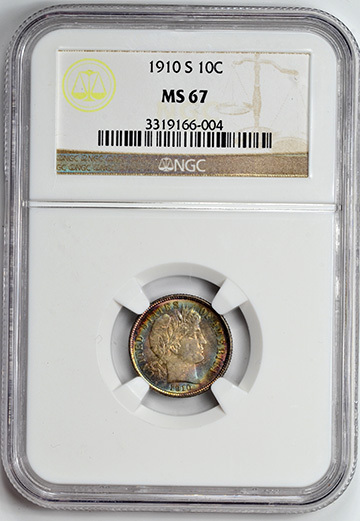 This lack of any great strike rarities in the Barber series stands in stark contrast to the next series, Adolph Weinman’s “Mercury” design, where mushy striking details make that series such a challenge. 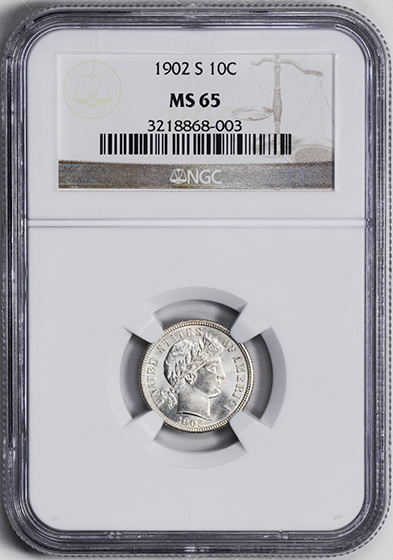 There is one great rarity in the Barber dime series, one of the rarest coins in all of U.S. numismatics—the 1894-S dime. Allegedly, 24 pieces were struck on orders from San Francisco Mint Superintendent J. Daggett. 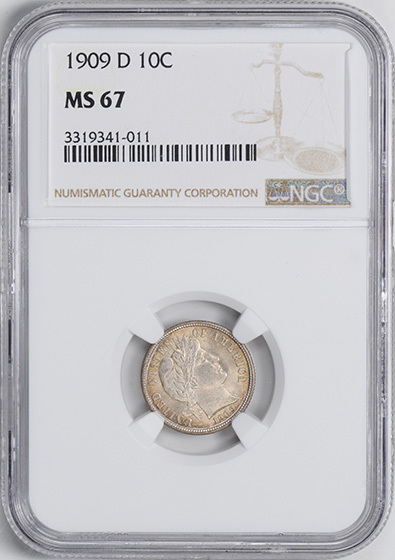 Only ten specimens can be accounted for today, which presents one of the great numismatic mysteries of the past hundred years: Where are the other fourteen 1894-S dimes that were reportedly struck? All of the known 1894-S dimes are proofs, and all were struck from the same set of dies. Much has been written on this fascinating rarity over the years, and there are many interesting stories and theories about these coins. Undoubtedly the best known story is that Superintendent Daggett gave three of the coins to his daughter Hallie and told her to keep them until she was as old as he was, when they would be worth a lot of money. On her way home from the mint, she spent one of the dimes on a dish of ice cream. Today that coin is known as the “Ice Cream Specimen.” The other two she kept and finally sold in the 1950s. 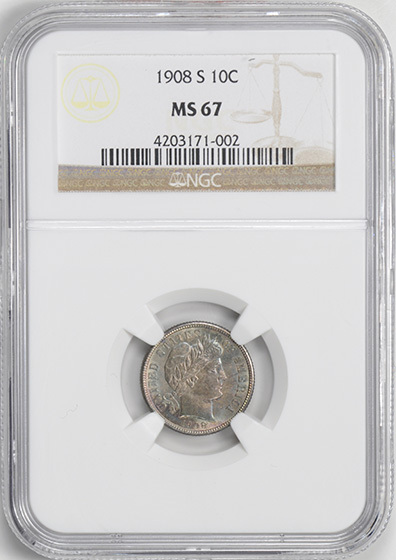 Grading Barber dimes is a relatively simple process. On high grade coins, signs of circulation will first appear on Liberty’s cheek and in the fields. For a coin to be uncirculated, all the mint luster must be uniform and unbroken over both sides. Proofs were struck in each year except 1916, and the only standout rarity in this series is the 1893/2 overdate. The 1894-S dime is the only issue to have been counterfeited in any appreciable numbers. Dangerous forgeries have been made by altering the mintmark on an 1894-O or adding one to a Philadelphia coin. Others were made in the mid-1970s in The Philippines. The series is commonly collected by beginners in Good to Very Good grades, while more advanced collectors prefer mint state and proof examples. Recently, however, collectors have showed a renewed interest in this and the other Barber series in XF and AU grades. Several issues of these intermediate grade coins are quite challenging to locate. Curiously, some issues are more difficult to locate in problem-free XF or AU than in mint state due to the hoarding of original BU rolls. 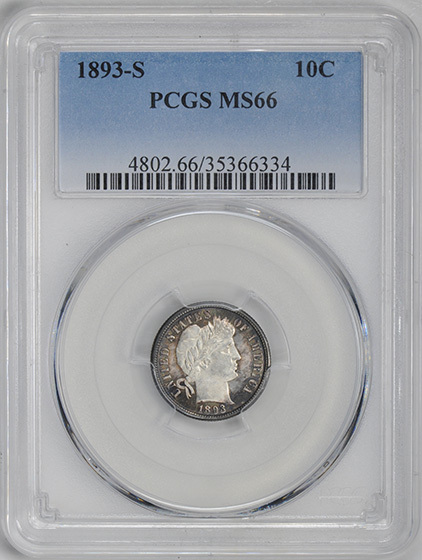 Barber dimes are also very popular with type collectors, especially in high grades. Because the series spans both the 19th and 20th centuries, anyone attempting to complete a type set from either century will need an example. 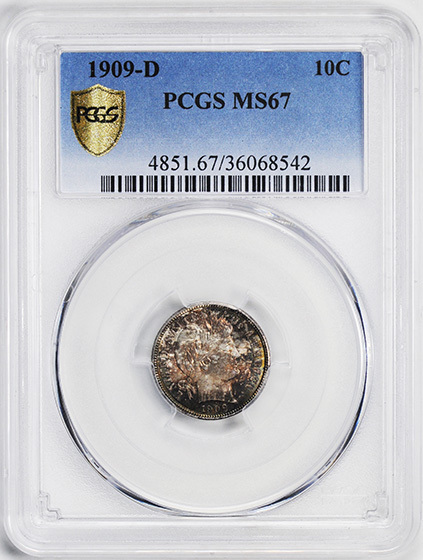 While the Barber dime may lack the artistic merit that designs before and after displayed, this type, with its distinctive 19th century motif, has remained a favorite with collectors over the decades. GEM SURFACES. TIED WITH TWO OTHER COINS FOR HIGHEST GRADED. LIGHT RUSSET TONING. FROSTY DEVICES. GEM ROSE/AQUA IRIDESCENT TONING LAYERED ON GEM SURFACES. 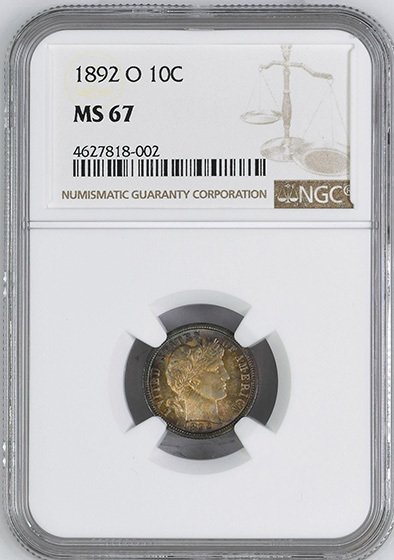 THIS IS THE SOLE HIGHEST GRADE BY NGC. GEM SATIN SURFACES. TIED WITH 3 OTHER COINS FOR HIGHEST GRADED. GEM CARTWHEEL LUSTEROUS SURFACES. SOLE HIGHEST GRADE AT PCGS. GEM SURFACES. GLORIOUS COLOR. TIED FOR HIGHEST GRADED. SATIN WHITE. 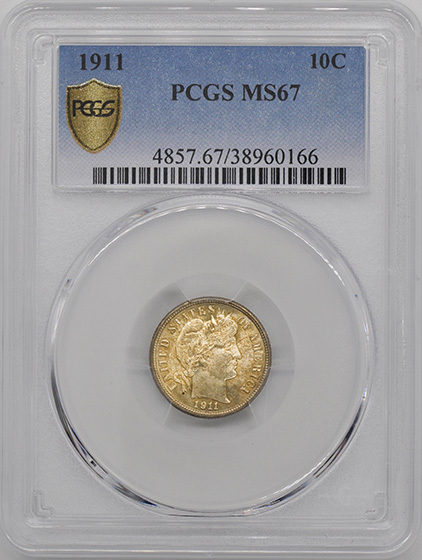 ONLY 5 GRADED HIGHER AT PCGS.